At Eich Roller Bearings we offer a variety of combinations of our modules. Various inner rings can be combined with other modules to give you the optimal bearing for your system. We see ourselves as experts for special cases and can also offer you an alternative solution for your problem thanks to the modular system of our bearings. Mainly rings or spring bushings are used as inner rings. Depending on the area of application, different combinations of inner rings with the other modules are the result. Both types of rings can be combined with different components. Possible module combinations can be found, for example, in the table of stock types or in a personal conversation. We will gladly advise you on which bearing type is suitable for your system and which combination is advisable. Thanks to the modular system, the perfect bearing can quickly be found. Also, the bearings from our modular system prove to be cost effective and durable, as individual parts can be replaced quickly and easily and the bearing does not have to be removed completely. Which solid inner ring is suitable? The solid inner ring of the company Eich is usually used when the bearing has to absorb or transmit a high axial force. It also offers a massive inner sleeve, if the bearing should be axially braced. In some combinations, the solid inner rings are installed in conjunction with a thrust bearing, so that the axial force can be transmitted more easily. In total, we offer eight types of bearings, where a massive inner ring is advisable. However, if the bearing is to withstand a high impact load or a strong dynamic or static load, it is more likely to use a spring loaded bushing. The flexible inner ring from Eich proves to be particularly insensitive to high impact loads and is also easy to assemble. Individual types with flexible inner rings are also characterized by their low height. In addition, spring bushing bearings are temperature insensitive because they expand with the bearing at high temperature. Thus, the modular bearing is maintained and a bearing damage due to high temperature is not expected. Altogether, the modular system of Eich roller bearings offers eight different bearing types, which can be mounted with a flexible inner ring. Therefore, a solution can quickly be found for your personal application. We also manufacture special bearings on request, so that they are tailored to you and your machinery. Just like the inner rings, the outer rings made by Eich can be combined in many ways. Various bearing types offer different advantages, which are adapted by us to the respective application. The modular system of the Eich roller bearings offers the advantage that the bearings are not standardized and can easily be repaired. Thanks to the modular system, it is not necessary to replace the entire bearing when a damage occurs. In most cases the functionality can be restored by the exchange of individual elements. In addition, the individual modules can be partially exchanged, so that you finally get the optimal bearing for your system. We are also happy to personally advise you which modules are the right combination for you. You can also find the necessary information in the tables below and put together the modules you need. If you have further questions, please do not hesitate to contact us by phone or e-mail. You can get to know for what purpose the outer rings are suitable, in the text below. Which outer ring is needed? 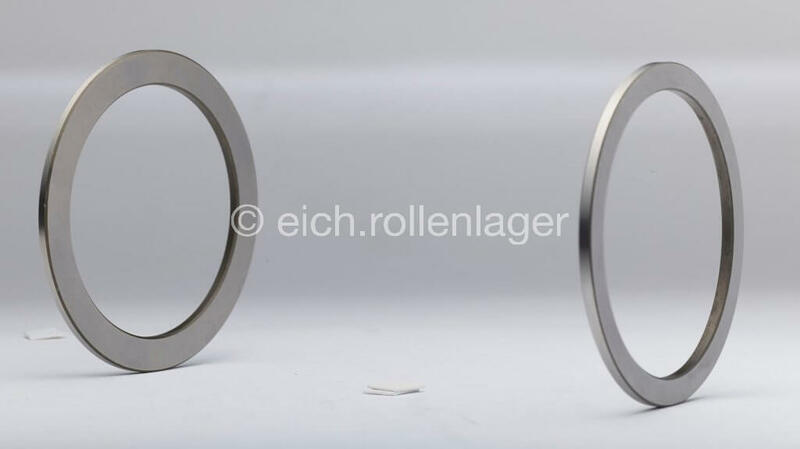 Outer rings from Eich Roller Bearings are available in two different types. We install both solid outer rings and flexible outer rings. These can be flexibly assembled with other components into functional bearings and have different advantages. For example, the solid outer rings of Eich roller bearings are always used when axial forces have to be transmitted. Also, these bearings are perfectly applicable at high temperatures. In addition, the solid outer rings are used in split bearing houses or without an inner ring because of space reasons. Also, such a bearing type can be used when a shock load is missing. In combination with a flexible inner ring or a flexible roller cage, however, a solid outer ring can still withstand high impact loads. Thanks to the hardened shaft, high dynamic and static loads can be borne. We offer a total of ten different types of bearings, where a massive outer cage can be installed. A flexible outer cage can only be used, when there is no split bearing housing. In conjunction with a spring roller cage, it is possible to omit the inner ring and to obtain the necessary space for the bearing. In such cases, the shaft should be specially hardened. Due to the lack of an inner ring, a very low height can be achieved. Flexible outer rings are particularly suitable for a strong impact load or a high temperature. The bearing types with flexible outer rings are easy to assemble and also the individual parts are exchanged quickly, so that a system can run smoothly and long-lasting. Ten of our types of bearings can be fitted with a flexible outer ring. Custom-made products are also possible. Please feel free to contact us. At Eich Roller Bearings we offer you various possibilities to find the right bearing for your application. We see ourselves as experts for special cases and do not produce standard warehouses. Nevertheless, we make it possible to set up various types of bearings with our modular system for the spring bushing. Due to the modular design, it is possible to partially replace parts, so that the bearing ultimately meets all requirements. The roller cages from Eich take up an important function in ensuring that the different roller bearings can run flawlessly. You can get to know, which components are suitable for you in the table below or in a personal interview. We would be happy to advise you which Eich roller bearing is the best solution to your problem. On request, we can also make a special bearing that can withstand both high heat and have a low height. You can red which roller cage can be used, in which areas of application in the text below. If you have further questions, feel free to send us an e-mail or contact us by phone. Which roller cage suits best? At Eich two different roller cages are used mainly in our roller bearings. A solid roller cage or a flexible roller cage can each be installed in ten different types of bearings. This always depends on which requirements the bearing must meet and which circumstances it is exposed to. Although the solid roller cages of Eich roller bearings can be used at a high temperature, but can not absorb shock loads. This is possible in combination with a spring bushing, but only to a certain extent. Solid roller cages are therefore usually used when a high dynamic or static load weighs on the bearing. Also, such roller cages can be used in split bearing housings. The use of a massive roller cages is also possible, if the bearing unit has to be constructed without an inner ring for reasons of space. As a result, a low height of the bearing is possible. If you need a bearing that can withstand high shock loads, it is advisable to mount a bearing with a flexible roller cage. An application without an inner ring is also possible because when it is needed. The shaft should then run on a hardened and ground shaft. The spring roller cages of Eich roller bearings are characterized by the fact that they are particularly shock-resistant, for example, in combination with a flexible outer cage. Since all modules of the spring roller bearings insert easily into each other even at high heat, because they ‘expand’ together, the insensitivity with high impact load is maintained even at high temperature. Furthermore, a low height of the bearing with spring roller basket is also possible. Also, a flexible roller cage can be used in combination with a solid outer ring in split bearing housings. In order to select the best possible bearing type for your individual system, we are happy to advise you personally. If necessary, we will find an alternative solution together with you. We are able to provide alternative solutions to every problem. Especially our spring bushings have proven themselves and are now widely used. In various combinations, the bearings can be put together individually. This enables us to offer you bearing units that are particularly heat-resistant, highly resistant to dirt or that can withstand high impact loads. In our modular system you will find 20 types of bearings, which are made up of different components. The inner and outer rings as well as the roller cages can be combined almost arbitrarily, depending on which requirements the bearing should meet. On request, we can also make you a special bearing. We see ourselves as experts for special cases and can find many individual solutions in consultation. In the end, the bearing should meet your requirements and, under the given circumstances, run smoothly for years to come. We are happy to advise you which warehouse is suitable for you. You can also look in the table below, which combinations are feasible. The Eich roller bearings from our modular system can be realized with or without thrust rings. There are inner and outer thrust rings, which can be installed for specific purposes. The fixed bearing variants are usually combined with several thrust rings to ensure functionality. Without these rings they are called floating bearings , which can be supplemented by thrust rings. When are thrust rings useful? If, for example, the roller cage is to be guided in a specific way, without starting on the housing or on the cover of the bearing, a realization of the spring bushing with thrust rings is possible. Whether you want this, or want to fall back on the floating bearing variant is up to you. We would be happy to advise you if it is possible or even necessary to have a thrust ring. This always depends on the application and the load of the different bearings. Thrust rings are also necessary if, for example, a spring bushing should take and pass axial forces. The thrust rings for floating bearings are available on request. We would be pleased to advise you personally, if thrust rings for bearing units are feasible and what function they will take over within the bearing. If you have any questions, please contact us by phone or e-mail. Together we will find an efficient and affordable individual solution.